As an author of psychological, paranormal and mystery fiction for young adults and new adults, I draw upon not only my imagination but also my life experience. Write about what you know, they say. Well, I partly agree with that. And I believe a lot of imagination, and often research, is important too! but who knows how your knowledge of your forbears, or your own past life-events, or the people you’ve met may influence your fiction? Often the effect they may have upon the imagination of the author lies within the unconscious. This is my family background – and it’s rooted in south London, very close to the river Thames. I wrote this article, and it was first published in Practical Family History Magazine in 2002. I’ve reproduced it here with a few changes. The family toolmerchants and ironmongers A.D. Skillman, facing the Thames at Woolwich, used to be a byword in South East England. It was started by my grandfather in December 1900 and had been in my family for 102 years when my brother Chris, the last owner, sadly had to close for business on 1st June 2002. The photo below was taken in May 2002. 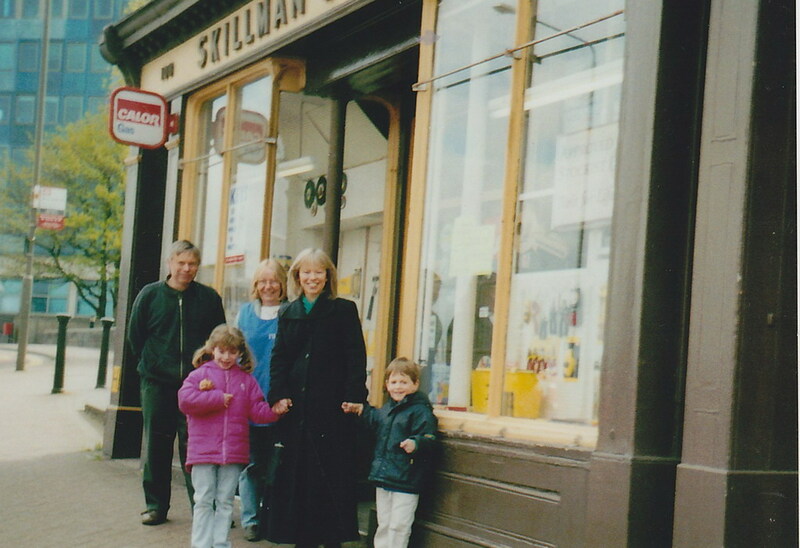 Shown in front of the shop, myself with my brother and sister in law and two children. When Alfred Daniel Skillman opened the shop in 1900 at the age of 38, he sold secondhand furniture, men’s suits, outdoor clothing, and musical instruments. He supplied harmonicas and ukeleles to the sailors docking in Woolwich. He was a true entrepreneur: when the big ships came up the Thames, he was ready to sell the sailors what they needed: at first, musical instruments; and later changing emphasis to tools and hardware. Subsequently A.D. Skillman & Son built up a strong reputation. It became known and loved as a supplier of all things DIY throughout the south east of England. Many colourful characters visited the shop over the years and every member of my family worked there during its history. A sign used to hang up by the door. “If you want it, we’ve got it, and if we haven’t got it, you don’t need it.” And over the years, the customers found this to be true. The name SKILLMAN used to be displayed in large red letters down a vertical sign outside the shop and it could be read from across the River Thames at North Woolwich. Customers used to come through the Woolwich foot tunnel to visit Skillman’s. Regulars made special trips to the shop from as far afield as Essex and Maidstone in Kent. In its heyday (the 1960’s and 70’s), Skillman’s was an Aladdin’s cave of ironmongery, in the days before health and safety regulations thinned out its display. I remember entering a grotto of hanging spades and forks and rakes, watering cans, paint pots, ten foot long yard brooms and hurricane lamps suspended from hooks in the ceiling. At the front of the shop were pigeonholes full of loose nails which I sold at sixpence a packet; tin tacks, pins, cut nails, galvalised clout nails and many more. I passed along narrow aisles between shelves packed high to the ceiling with boxes full of shackles, spirit levels, wire rope grips, pine door-knobs of different sizes, right-angled shelving brackets, different types of sash cords. Hanging up near the counter was a collection of all sizes of chain from very small bath plug chain right up to a massive chain you could bolt your car to a bollard with. Alfred Daniel (1862–1936) was born in Barking, Essex, the third of seven children to Richard Skillman and Elizabeth Bradley, of whom three did not survive infancy. During Alfred’s childhood, his father Richard was coachman to the retired Admiral Seymour, living with his family above the coach-house with Elizabeth and children at the Admiral’s home in North Audley Street, London W1. Later Alfred was to tell his own children stories of his friendship with the Admiral’s cook, who used to give him titbits as he was her favourite. He said, “I used to live like a lord before I was 14”, as the family shared the food of the Admiral’s household. However, life changed abruptly for Alfred after the age of 14. He had to leave school and earn his living. He became assistant to a London pawnbroker where he used to sleep under the counter. Later he was offered the managership of another pawnbroker’s business but refused it. He married twice. His first marriage, to Alice Maud French, took place in 1890. Alice died just two years later soon after bearing him a son, Alfred William. In December 1900 Alfred opened his shop A.D. Skillman. It was at 147 Woolwich High Street. Two years later he married Florence Lumley at St Mary’s Church, Woolwich. In 1914 he moved down the High Street to Number 108 with wife Florence, son Albert (9) and daughters Florence (7) and Eileen (3). In the following year my father Ken was born. They all lived in the flat above the shop at Number 108. For the next few years the shop continued as a general store selling antique furniture, musical instruments, men’s suits and outdoor clothing. During the late 1920’s/early 1930’s however, it changed emphasis to become a toolmerchants and ironmongers shop. All Alfred’s children helped out in the shop on Saturdays and in the evenings. When Alfred died in 1936 it was taken over by my grandmother Florence. A key figure in the shop at this time was my aunt Eileen. She had started her working life as a court dressmaker but eventually became disillusioned with her dressmaking business and left. After a period of time considering her future options, she decided to go into the family business, becoming fully involved from 1936, the year of Alfred’s death. When the war started Eileen applied for exemption from war service. This was granted to her, and she stayed to look after the shop during the war years, thus ensuring the continuation of the family business. She kept the shop going from 1939 to 1945 with imported tools from America. When the war ended she was re-joined by my father Ken, my other aunt Flo, and Eileen’s new husband Josef Stanzig (my uncle Joe). Born in Vienna of a Jewish father and Roman Catholic mother, Josef had fled the persecution of the Nazis before the War. Arriving in Woolwich, he first met Eileen as a regular customer at Skillman’s. He eventually married her, and subsequently joined the workforce there himself. In 1945 Ken returned from war service as a member of the ground staff for the Air Force to work in the family business full-time. From that time on, the shop diversified into modern age materials such as plastics and aluminiums and tools suitable for the local engineering trades, specifically the Royal Arsenal Munitions and Ordinance which closed on 1 January 1995. It is by the way now a beautiful development, Royal Arsenal Riverside, which I last visited in August 2010. The site includes Firepower – the Royal Artillery Museum and the Greenwich Heritage Centre. My father had run the business for five years when he was joined by my brother Chris in March 1967, the year of Chris’s marriage to Freda. Chris had run the shop since the early 1980’s, latterly with Freda’s support on the accounts side. He took over fully upon my father’s retirement in 1985. But sadly the shop is no more. The changes in the industrial infrastructure of Woolwich since the 1960’s and the gradual erosion of business over ten years of continuous economic and social change meant that Chris finally had to close for business on 1 June 2002, bringing to completion a 102 year-old era of Skillman family history. Ken recalled that he used to see many Chinese sailors in the shop, buying two-and-a-half inch by half-inch Tungsten steel lathe tools for their heavy engineering industries. “Woolwich used to be a major shopping centre,” he told me. “Then all the big shops moved out to Bexleyheath and Lewisham and the superstores started to go up. In the late 1950’s and early 60’s we sold a lot of electric drills – Black & Decker and Wolf tools. That business gradually faded away. Do It All and B & Q have taken over in the last ten years. The shop had come a long way from its early days as a supplier of musical instruments. Alfred showed musical interests from an early age and was a choirboy at St Mark’s Church South Audley Street, London in the 1870’s. Love of music continued through his life and he encouraged his sons Ken and Albert to form a musical trio with one of Albert’s friends, Ken on the piano and the other two on the violin. Musician Tom Bunce, approaching his 90th birthday at the time I spoke to him in 2002, had fond memories of Skillman’s. He told me he recalled buying a trumpet there in the 1930’s. “A friend and I visited Skillman’s where a lovely array of musical instruments was on display. We were there on the suggestion of Mr Clarence Maggs (himself a trombone player and at that time, musical director of an orchestra which played at Eltham Park Methodist Church). “In those days we were known as the Brotherhood Orchestra – now known as Eltham Park Pleasant Sunday Afternoon Orchestra. Mr Maggs had decided to strengthen the orchestra by adding some regular brass players and he had offered free tuition to anyone willing to take up a brass instrument. So my friend Jim Hopkins was looking for a trombone and I was looking for a trumpet. I don’t know the cost of the trombone, but I bought a splendid silver-plated French Besson trumpet for the sum of £3.10s – its value today is estimated to be at least £50. “It might have been Chris Skillman’s granddad Alfred who served us – who knows? “Since then, the trumpet has served me well in the orchestra and also in a dance band. My son Martin (now a professional trumpet player) has sometimes borrowed it when studying at the Guildhall School of Music when his own trumpet needed an overhaul and he has made some splendid recordings on the Besson. When because of heart trouble I was advised by my doctor to give up trumpet playing, the instrument went up in my loft for a while but at Christmas time I used to join the brass players on second trumpet playing carols round the streets of New Eltham in aid of the National Children’s Home. At present the trumpet is owned and regularly used by another member of our orchestra. It has been overhauled and is in good form. As I am approaching my 90th birthday I don’t suppose I shall be playing the trumpet again – but it has been and still is a wonderful instrument. Yes I think someone else told me about another sign he had up which said something similar! He was certianly a very colourful character whom I remember well! thank you for the follow. Love the history here – reminds me of my great grandparents and their shops in Streatham and Tottenham Court Road. Thats interesting that you share a south London background with me! Did your grandparents’ businesses continue to the next generation? hi, I worked for ken back in the sixties, a lovely man. also remember joe stanzig who taught me a lot about people and business. I still use some of joes anecdotes to this day. Hi Ramona, thank you for contacting me. I do have a family tree for the Skillman family, tracing back my Skillman ancestors via my grandfather; but it only goes back to 1743 to the death of Simon Skillman. However, I will ask my brother-in-law to contact you as he is an expert on family history research, and has done a lot of work on ancestry.com. He will be interested to hear from you and may have further information.